It’s that time of year again! Craziness with the CFZ! So if you have nothing better to do over the weekend of the 18th-20th August, then I highly recommend you head down to Devon and have some damn find crypto-fun! Highlights will definitely include some alcohol, giggles, a damn good meal or two and Richard Freeman looking very dapper in his Gambia-Stained Safari Suit… nice! For the seventh year running, devotees of the weird and wonderful, the strange and supernatural, and the downright odd will be converging into Devon for what has become the biggest event of this type of the year. The weekend of 18-20th August, will see the little North Devon village of Woolfardisworthy (Woolsery), becoming the weirdest village in the land! The ‘Weird Weekend’ was the brainchild of Jonathan Downes (46), Director of the Centre for Fortean Zoology the world’s largest cryptozoological (mystery animal research) organization. “Because we receive no Government funding, we are thrown back onto our own resources to a certain extent” he says. “Each year we finance research across the globe into looking for unknown animal species, and it gets expensive. 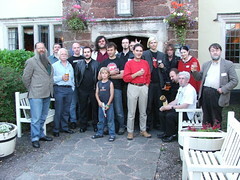 So, seven years ago, we decided to hire a pub for the weekend, invite some people to lecture on subjects that we found interesting, and see if the public were interested in coming along”. Paul Cropper from Australia will be telling us about the yowie (the Australian version of the yeti). But if this all sounds a bit too monster orientated for you, then never fear. Other speakers from the worlds of crop circles, ufos, ghosts and folklore will be there to entertain you as well, and (if we can find the right place to do it , and a farmer with a sense of the absurd), we will even have a master class in how to make a crop circle for yourself. “The weird weekend is always great fun”, says Jon “and I hope that lots of people will come along and join in. There will be lectures, films, workshops, exhibitions, stalls, and even a Mad Hatter’s Tea Party for the kids.” Tickets are £20 in advance (£15 for OAPs, students, and disabled), and day tickets are also available. Look on the CFZ website (www.cfz.org.uk ) for details. All proceeds from this year’s event (tickets are £20 a head for the weekend by the way), go towards financing a second expedition to Mongolia in July 2007, in search of the fabled Mongolian deathworm, a 3-4 foot long snake like animal said to be deadly poisonous and which is unknown to science.